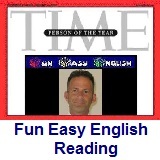 ﻿ Fun Easy English - reading practice and learning about the holiday George Washington Birthday. Today is the actual birthday of George Washington. He was the first president of the United States of America. Hi. In the classroom today you will learn about George Washington. George Washington was born on February 22nd, 1732. He was born on the family's Pope's Creek Estate near present-day Colonial Beach in Westmoreland County, Virginia. He was the first son of Augustine Washington and his second wife, Mary Ball Washington. George Washington was introduced to Martha Dandridge Custis by friends of Martha when George was on leave from the French and Indian War. George only visited her home twice before proposing marriage to her 3 weeks after they met. George and Martha were each 27 years old when they married on January 6th, 1759. The newlywed couple moved to Mount Vernon. George Washington led the Continental Army to victory over the Kingdom of Great Britain in the American Revolutionary War from 1775 to 1783. The Continental Congress appointed Washington commander-in-chief of the American revolutionary forces in 1775. The following year, he forced the British out of Boston, lost New York City, and crossed the Delaware River in New Jersey, defeating the surprised enemy units. As a result of his strategy, Revolutionary forces captured the two main British combat armies at Saratoga and Yorktown. Negotiating with Congress, the colonial states, and French allies, he held together a tenuous army and a fragile nation. Following the end of the war in 1783, Washington returned to private life and retired to his plantation at Mount Vernon. He presided over the Philadelphia Convention that drafted the United States Constitution in 1787 because of general dissatisfaction with the Articles of Confederation. George Washington served as the President of the United States of America from 1789 to 1797. He sought to create a great nation capable of surviving in a world torn asunder by war between Britain and France. His unilateral Proclamation of Neutrality of 1793 provided a basis for avoiding any involvement in foreign conflicts. He supported plans to build a strong central government by funding the national debt, implementing an effective tax system, and creating a national bank. Washington avoided the temptation of war and began a decade of peace with Britain via the Jay Treaty in 1795. Washington's farewell address was a primer on republican virtue and a stern warning against partisanship, sectionalism, and involvement in foreign wars. Washington is seen as a symbol of the United States and republicanism in practice. His devotion to civic virtue made him an exemplary figure among early American politicians. Since Washington was the first president of the United States of America, he is a favorite among young American kids. There is legend about Washington cutting a cherry tree when he was a young boy. 1. George Washington was born on which date? 2. George Washington was born in which state? 3. Who were George Washington's parents? 4. Who did George Washington marry? 5. What age were George and Martha when they were married? 6. Where did George and Martha move to after they were married? 7. The American Revolutionary War was fought during which years? 8. Where did Washington return to in 1783? 9. George Washington was president during which years? 10. Washington began a decade of peace with Britain via which treaty in 1795?